It's ok if things didn't go as planned. This post-mortem template helps your team identify opportunities to become better together. Give a brief synopsis of the event. Include aspects like plans, timelines, and deliverables if applicable. Summarize the incident. What happened compared to what should have happened? Provide context so other team members can understand. Do any key stakeholders have discussion points to contribute? Share this template before the post-mortem meeting to gather feedback. What barriers or unexpected obstacles arose that changed the outcome of this event? Identify the main cause of each issue above. Be specific. Were objectives clear? Was the schedule realistic? Did any changes in scope occur? Summarize the key insights from this post-mortem. How can we ensure this incident doesn't happen again? What should we do differently next time? List any additional resources that can help the team address all risks and root causes identified. What can be done now? Who is responsible? Clarify any next steps, who's completing them, and when they should be done by. Note this information here to share. Things don't always go as planned. But that doesn't mean you can't plan for a brighter future. Post-mortem meetings present a powerful opportunity for your team to grow. Ensure your insights from these times of reflection translate into value with our post-mortem template. When done well, post-mortems become a vehicle to help your team continuously improve their work and become better than before. This meeting note template streamlines this process through adaptability, transparency, and action. Every team has their own unique way of approaching post-mortem meetings. But every meeting requires the same thing to stay on track: an agenda. This post-mortem template is flexible and customizable. So whether you're dealing with product bugs or system downtimes, simplify meetings by tailoring the agenda to uncover the root causes of these outcomes. Our meeting note template can also be centralized and shared. Before each meeting, share the agenda to easily gather any discussion points and feedback from key stakeholders. You can also keep your entire team aligned about main takeaways after the meeting, even if they weren't in the room. Sharing the post-mortem process and resulting insights keeps your team moving forward together. Lastly, this post-mortem template empowers your team to take meaningful action. All too often, teams capture the insights without acting upon them later. 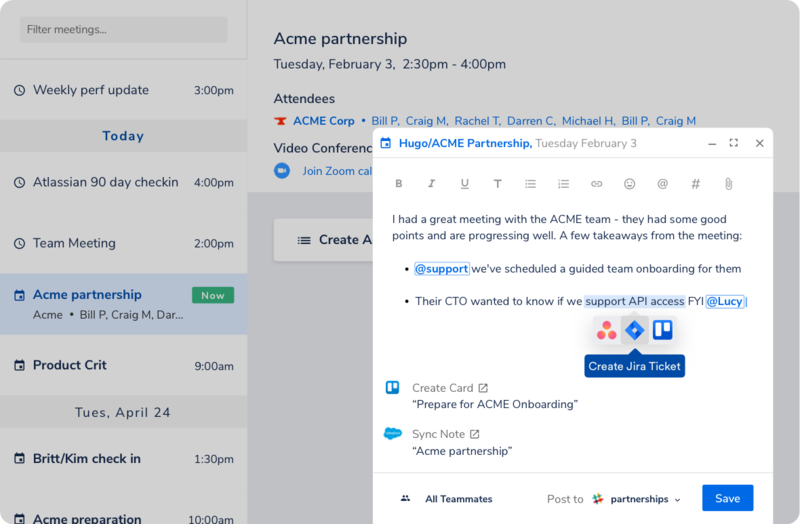 With seamless integration into your favorite workflow tools and the ability to make your notes assignable actions, your team can start improving immediately after the meeting. There are no mistakes, only lessons. Growth is a process of trial and error. This meeting note template lets you identify opportunities for improvement and transform them into a reality.